This excerpt from the biography of Srila Gaura-kishora Dasa Babaji, written by Srila Bhaktisiddhanta Saraswati Goswami, gives clear insight into the qualifications and activities of a pure Vaishnava (devotee of Vishnu, or Krishna). How Can I Know a Vaishnava? “Those persons who then surrender unto the pure devotee are eventually able to attain pure devotional service. Extremely fortunate persons are able to approach Krishna by the mercy of the devotee. Otherwise, being unfortunate, the pure devotee may in some way or another act in such a way as to reject them. Sober devotees always pray to the lotus feet of Sri Nityananda Prabhu and Sri Chaitanya Mahaprabhu to become more serious and non-deviates. It is by their mercy that one is able to understand the character of the pure devotee. By the favor of Sri Chaitanya Mahaprabhu and Sri Nityananda Prabhu one’s heart becomes free from all pride and becomes filled with humility. 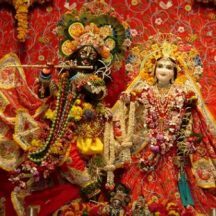 In this condition, Sri Chaitanya Mahaprabhu and Nityananda Prabhu manifest the identity of the pure devotee. The pure devotee’s identity is manifest by Lord Chaitanya and Lord Nityananda and then Lord Nityananda and Lord Chaitanya make the devotees known to everyone. [This is how] it has been mentioned in the Caitanya-Caritamrta.